Author: Raphaëlle Haywood and Andrew Collier Cameron at the University of St Andrews. The first exoplanet to be discovered, back in 1995, was a Jupiter-mass planet in extremely close orbit to its parent star 51 Peg, a solar analog . In recent years, space-based photometric missions such as the CoRoT and Kepler satellites have yielded dozens of exoplanets with sizes similar to Earth, by detecting the tiny periodic dips in light incurred by planets as they transit their host stars. But an exoplanet is only ever confirmed once it is weighed. The most common method used to determine the mass of an extra-solar planet, known as the radial-velocity method, involves monitoring the variations in the star’s line-of-sight velocity as the planet’s orbit causes it to wobble around their common centre of mass. In the case of 51 Peg b, these variations are of the order of several tens of metres per second; however, for an Earth-mass planet, the induced variations are of the order of a few centimetres per second. Such tiny Doppler shifts must be monitored with extremely stable and precise spectrographs, such as the High-Accuracy Planet Searcher HARPS, mounted on the 3.6m telescope at La Silla, Chile , and HARPS-North, on the Telescopio Nazionale Galileo at La Palma, Spain . Why are exoplanet hunters interested in the Sun? They have high-precision instruments and plenty of candidates for Earth 2.0 to look at. Why would they possibly want to look at the Sun? The catch is, the intrinsic variability of the stars themselves currently makes it impossible to detect the reflex motion of such small planets. In our own Solar System, the Earth’s orbit induces a solar reflex motion of just 0.09 m/s, while the presence of magnetic features on the solar photosphere (such as sunspots, faculae and granulation) induce radial-velocity perturbations between about 1 and 7 m/s! And the Sun does not seem to be particularly more active than the other Sun-like stars targeted by radial-velocity exoplanet surveys. The Sun is the only star that we can resolve directly with high spatial resolution; it is therefore a unique test case to gain a deeper understanding of magnetic activity-induced radial-velocity variability, which is crucial to the detection of Earth twins. 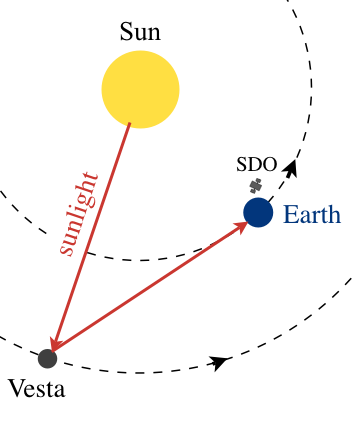 Figure 1: Rather than looking straight at the Sun and melting ESO's 3.6m telescope, we pointed it at the asteroid Vesta, which reflects the Sun's light. We wanted to observe the Sun as a distant, point-like star, through the exoplanet-hunting instrument HARPS . Of course, pointing the 3.6m telescope at the Sun directly would have had disastrous consequences, so instead we pointed it at the bright asteroid Vesta which reflects the light of the Sun. We used ephemeris data from JPL Horizons to place the Sun back into its rest frame and remove the orbital reflex motions induced by the orbit of all the bodies in the Solar System, and corrected for Vesta’s axial rotation. In the end we were left with a radial-velocity signal with an amplitude of 7-8 m/s, modulated by the Sun’s rotation: the Sun’s intrinsic radial-velocity variations! In parallel, we used simultaneous images from the Solar Dynamics Observatory (SDO) Helioseismic Magnetic Imager (HMI) instrument to determine the solar radial-velocity variations, according to a method previously developed by Meunier and collaborators . Granulation is the surface signature of convection: hot, bright parcels of fluid rise up to the surface, appearing as granules; once this fluid has cooled it sinks back into the solar interior via the intergranular lanes. The rising material in the granules emits blueshifted light, while material that is sinking is redshifted. Because the (blueshifted) granules occupy a much larger area on the solar surface (hot fluid is less dense than cooler fluid), and they are brighter than the (redshifted) intergranular lanes, we see a net blueshift overall, of about 200 m/s [5,6]. This net blueshift would not cause any trouble to exoplanet hunters if it were stable. Unfortunately, when a magnetically active region is present on the solar (stellar) surface, it inhibits the convective motions below it, thus reducing this convective blueshift. The amplitude of this reduction varies as the active regions emerge, grow and decay, and it is modulated by the solar rotation as the magnetic features come in and out of view. We reconstructed the radial-velocity variations induced by this effect from SDO/HMI images, magnetograms and dopplergrams of sunspots and faculae, and compared them to our HARPS Sun-as-a-star observations. We found that the SDO/HMI reconstruction matched the HARPS observations very well, and that this physical phenomenon accounts for the major part of the radial-velocity variations in agreement with the previous study of Meunier and collaborators [5,7]. Furthermore, when we separated out the individual effects of sunspots and faculae, we saw that faculae were the main contributors to the radial-velocity variations [4,5]. What does this mean for exoplanet hunters? One way to disentangle activity-induced variations from variations due to a true exoplanet orbit is to decorrelate radial-velocity variations against a magnetic activity indicator, or activity proxy, thereby allowing us to isolate the planetary signal. We found that the indicators traditionally used by exoplanet hunters did not correlate well with our Sun-as-a-star radial-velocity observations. However, when we constructed the disc-averaged magnetic flux variations of the Sun from SDO/HMI images we found that they correlate very well with our HARPS observations of the Sun as a star. Unfortunately it is not yet possible to measure the full disc-averaged magnetic flux in other slow-rotating, Sun-like stars [8,9], although we hope to do so in the future. Our present study tells exoplanet hunters which direction to follow: we must look for direct tracers of the stellar magnetic flux, and/or for faculae (rather than spots, which are easy to detect but a minor contributor). Thanks to the HARPS-N instrument which is now fed by a small solar telescope on a daily basis [10,11], we now have thousands of radial-velocity observations of the Sun as a star spanning more than a year, and are actively pursuing our present work. Stay tuned for more! Figure2 : The new solar telescope at La Palma, Spain sitting on the dome of the TNG. It feeds the HARPS-N spectrograph to produce high-precision Sun-as-a-star radial velocities. Dumusque, X., et al., Astrophys. J. 814, L21 (2015).